Became a Wife. Becoming a Hostess. I enjoyed making this dessert because it was different. I believe chocolate dipped strawberries are simple, but this offered a unique presentation. 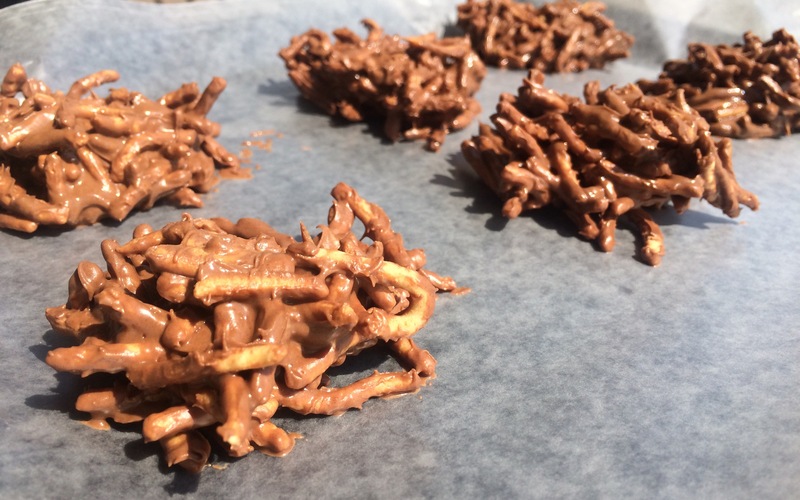 You can use this recipe for any occasion and it’s super easy and quick! 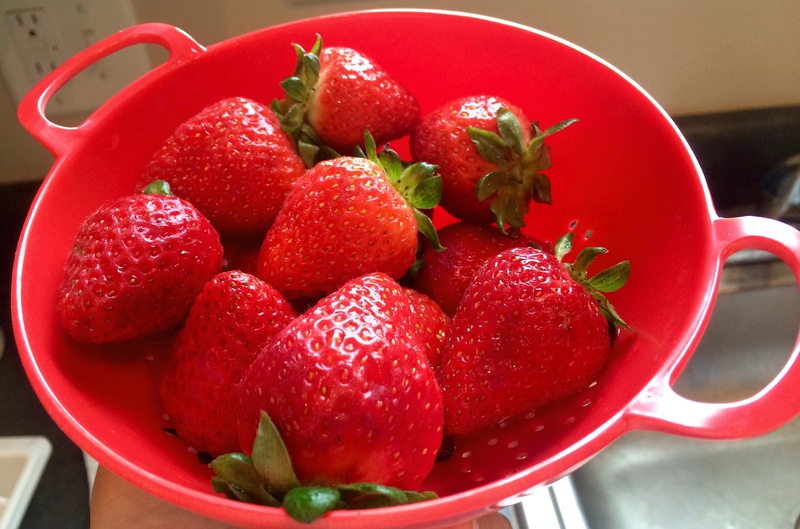 Rinse strawberries and set aside. 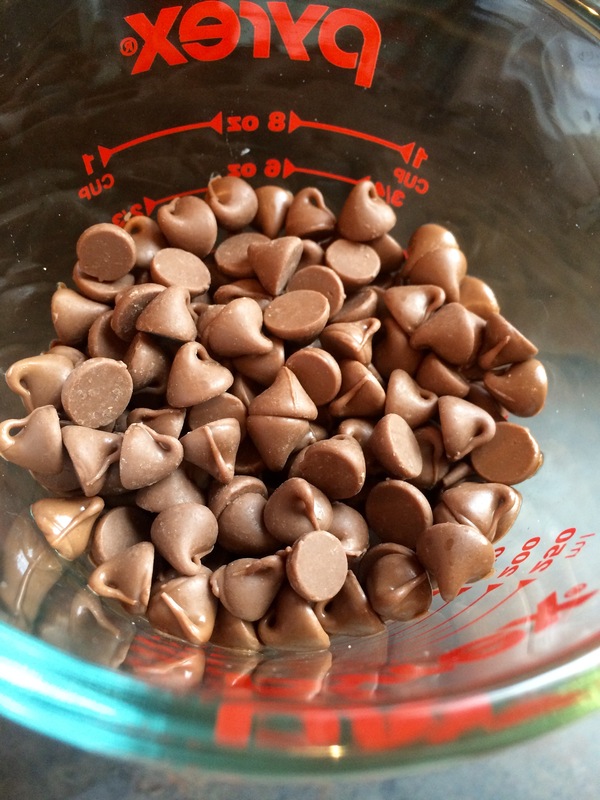 Melt chocolate morsels in microwave for 30 seconds (I melted them in a Pyrex measuring cup). Stir. 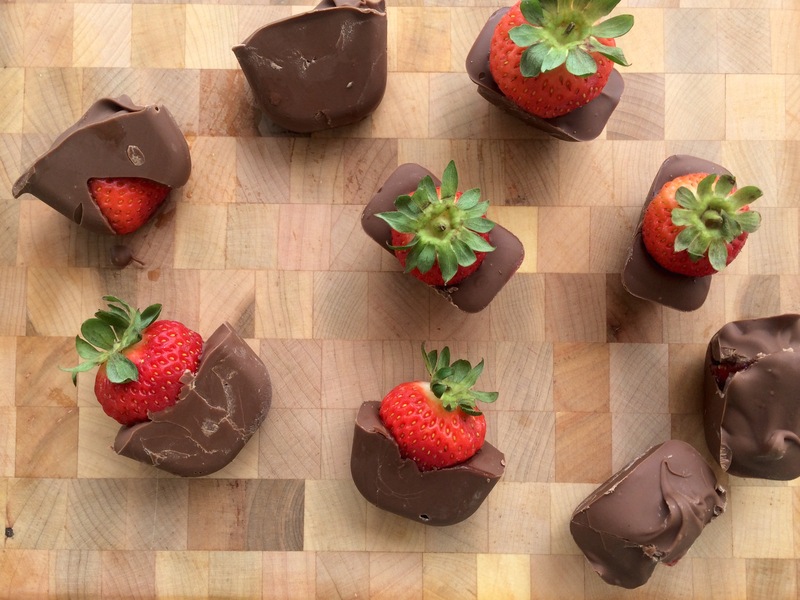 Repeat until the chocolate is melted (and not burned). 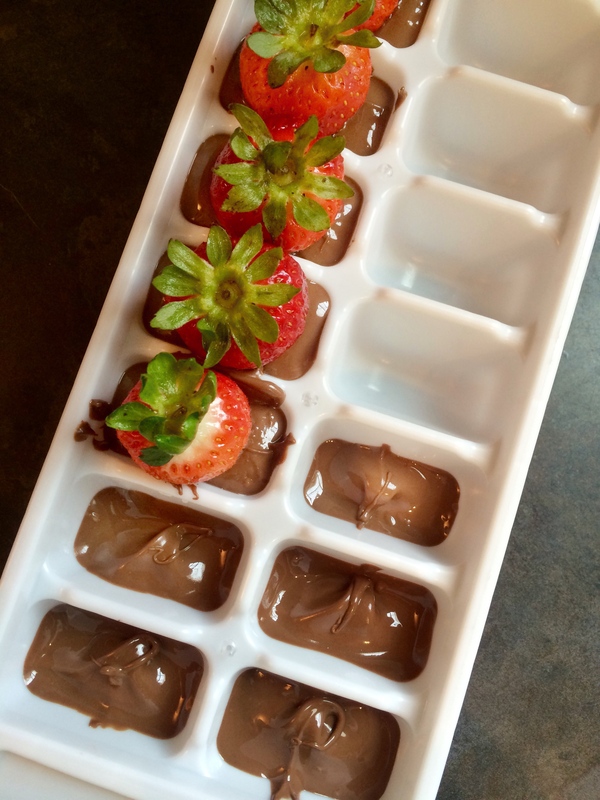 Pour enough chocolate to cover bottom of ice-cube tray. Add half a strawberry. Pour remaining chocolate until it is level with the tray. Repeat. Place in fridge for hour. Submerge the strawberry. This is just to show you the level of chocolate. 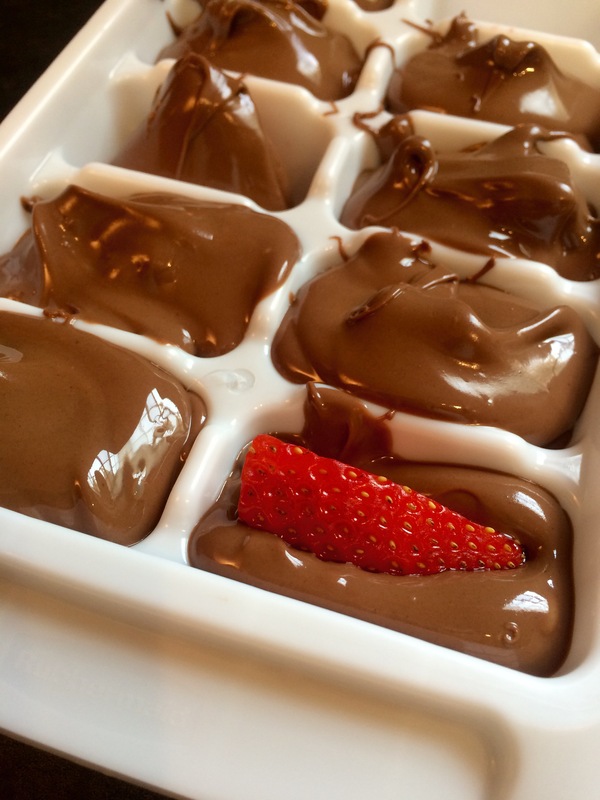 Melt chocolate morsels in microwave for 30 seconds. Stir. Repeat until the chocolate is melted (and not burned). Cooking outside the box-ed meals (see what I did there? ), has expanded my cooking vocabulary. 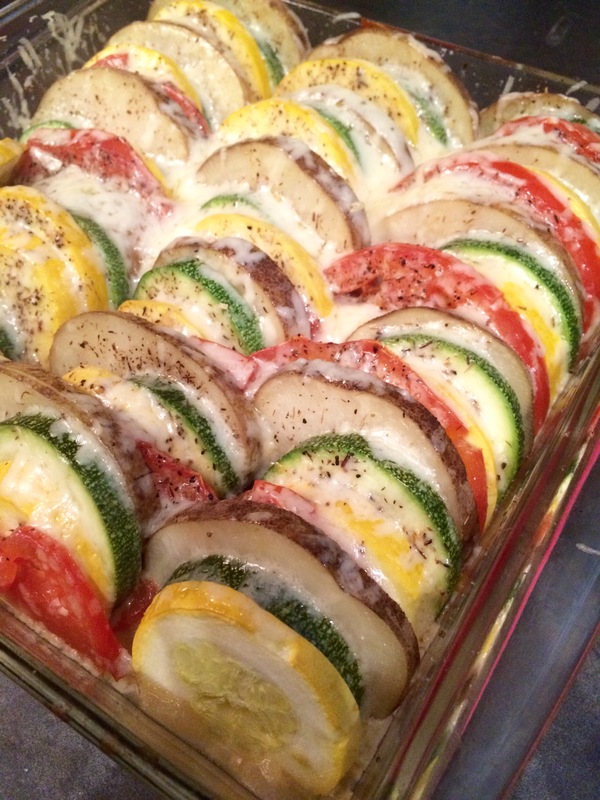 Tonight, I cooked a vegetable tian (Williams Sonoma Definition)! Total cost for this meal was under $10. Another first for the books included using my Cuisinart Mandoline to slice my vegetables. It was quick, easy, and FUN! All fingers are still intact. I would add that all chopping or slicing items should be used during non-rush hour Atlanta traffic. In case you do catch the edge of a blade, you have plenty of time to get to the Emergency Room (you’re welcome for that nursing education for the day). 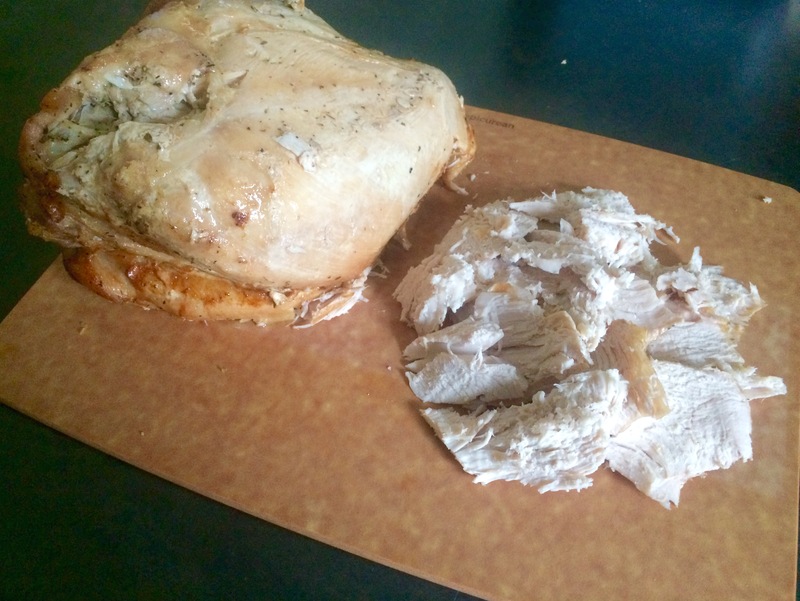 Update: The turkey from Herb Roasted Turkey refrigerated well and was still tender and moist. 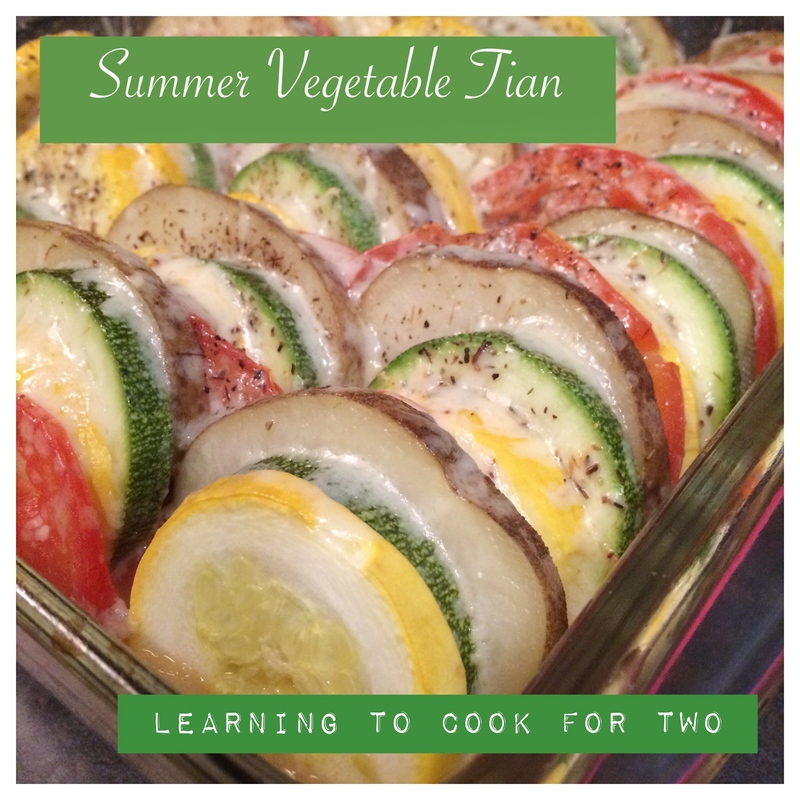 I used the turkey from this meal as the main dish with the summer vegetable tian as the side. Mix olive oil, garlic, and onion in skillet. Sauté until onion is softened (I used medium heat for about 5 minutes). Thinly slice the rest of the vegetables (or use your Cuisinart Mandoline to quicken the process). Spray the inside of an 8×8 square with non-stick spray (you know my choice by now is coconut oil). 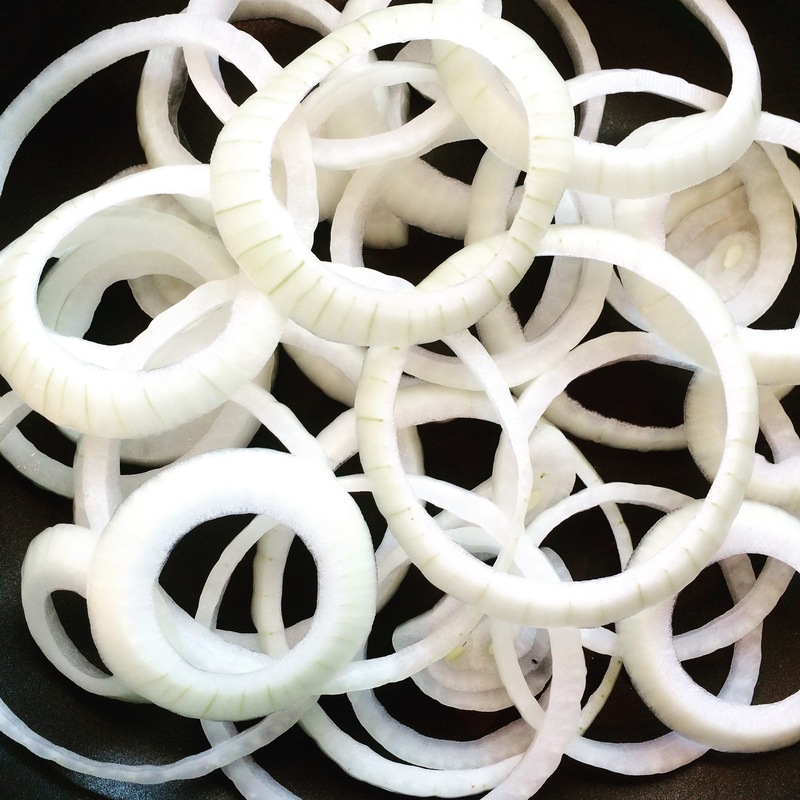 Spread sautéed onion on bottom of baking dish. 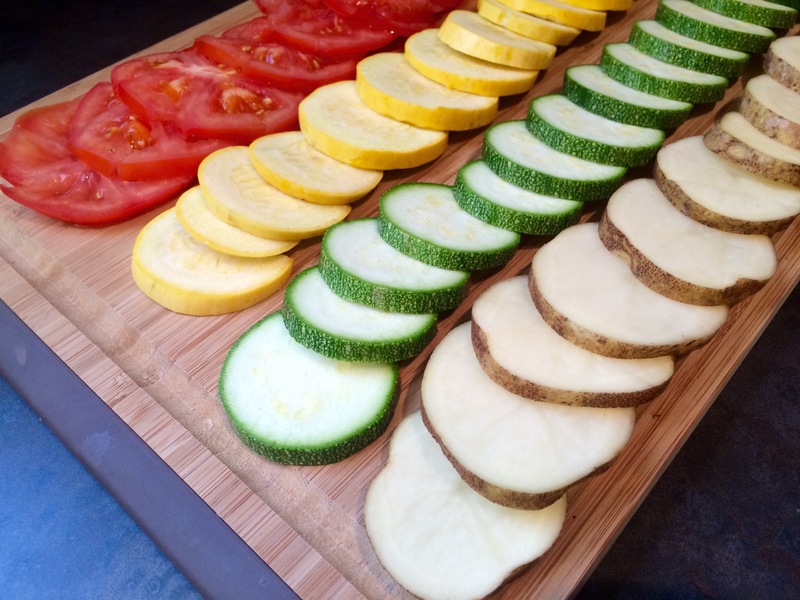 Place thinly sliced vegetables in the baking dish, vertically. Alternate the vegetables and sprinkle with salt, pepper, and thyme when complete. Cover the dish with foil and bake for 30 minutes. Remove foil, top with cheese and bake for another 15-20 minutes. P.S. 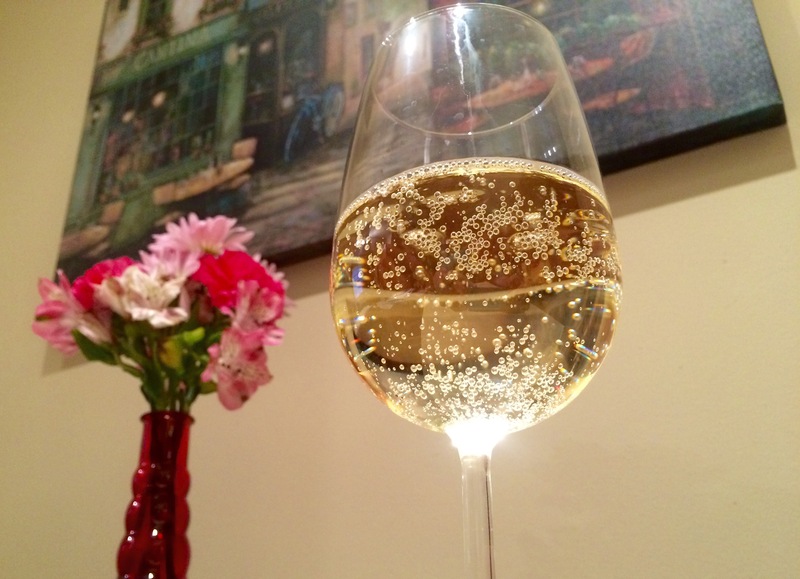 Cupcake Moscato D’Asti added great flavor (but I’m bias because it’s my favorite). There is a Friends reference for everything. My mom and I joke that we have always found a Friends reference for all occasions. Therefore, it is fitting that the first time I cook a turkey, I find a Friends quote to capture this moment. I’ll be honest, I was nervous about roasting my first turkey. I wasn’t worried about what my husband would think, because there is a McDonald’s around the corner if the turkey didn’t turn out right. I wanted to accomplish a cooking task that felt was “out of my scope of practice,” as we would say in the nursing world. I have never hosted a Thanksgiving at our house, but I felt this was great practice for that possibility in the future. I will admit, I had a hard time finding a whole turkey this time of year, but I substituted it for a 7 pound turkey breast (so excited that I didn’t have to remove the insides). Stir the stock, lemon juice, basil, thyme, and black pepper in a small bowl. Roast the turkey according to the package directions (the turkey I prepared took approximately 3 hours on 350 degrees), basting every 30 minutes (or whenever you are able in between chores or Netflix) with the stock mixture while cooking. 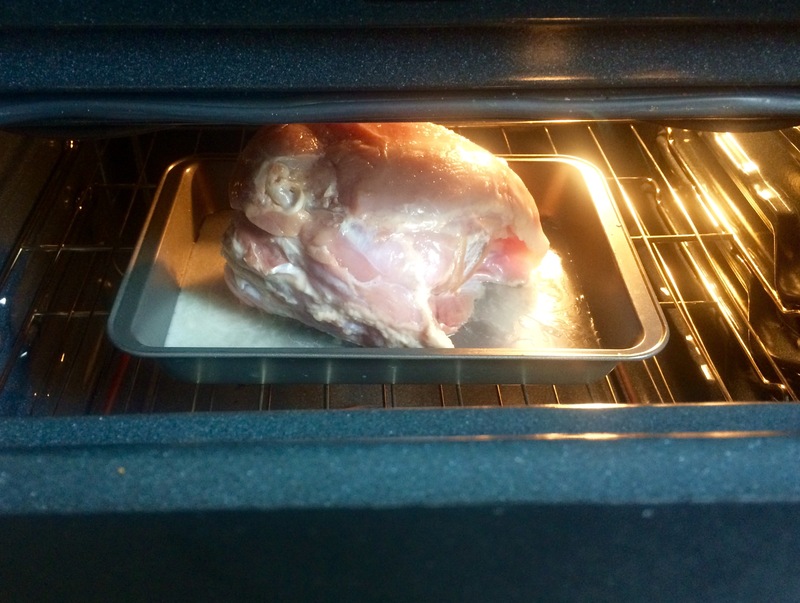 Let turkey stand for 10 minutes before slicing. Stir the remaining stock mixture and flour in a small bowl until the mixture is smooth. 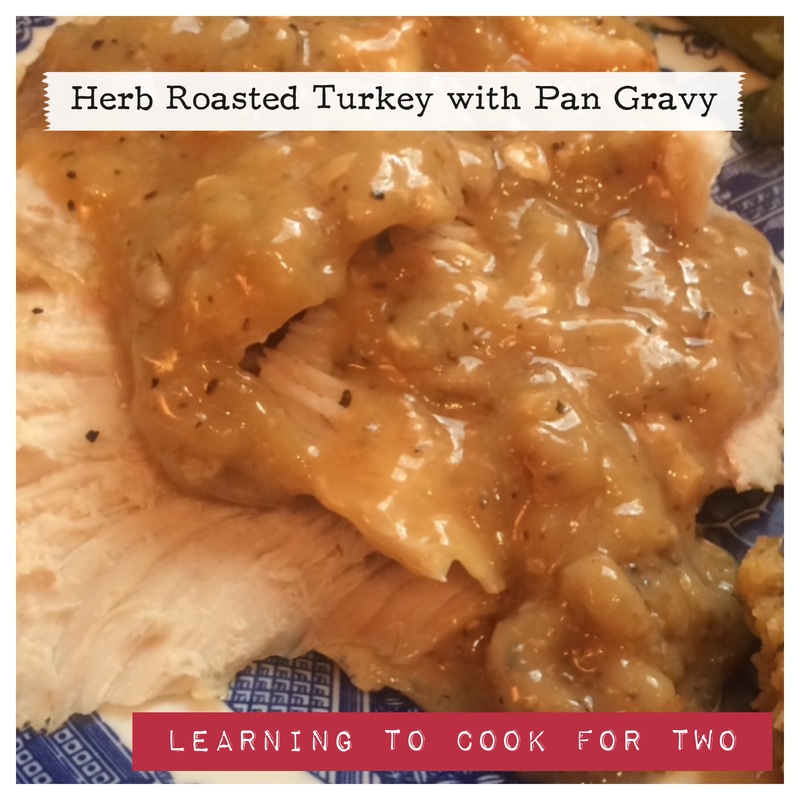 Remove turkey from roasting pan and spoon off any fat that remains. Add the stock mixture to the roasting pan. 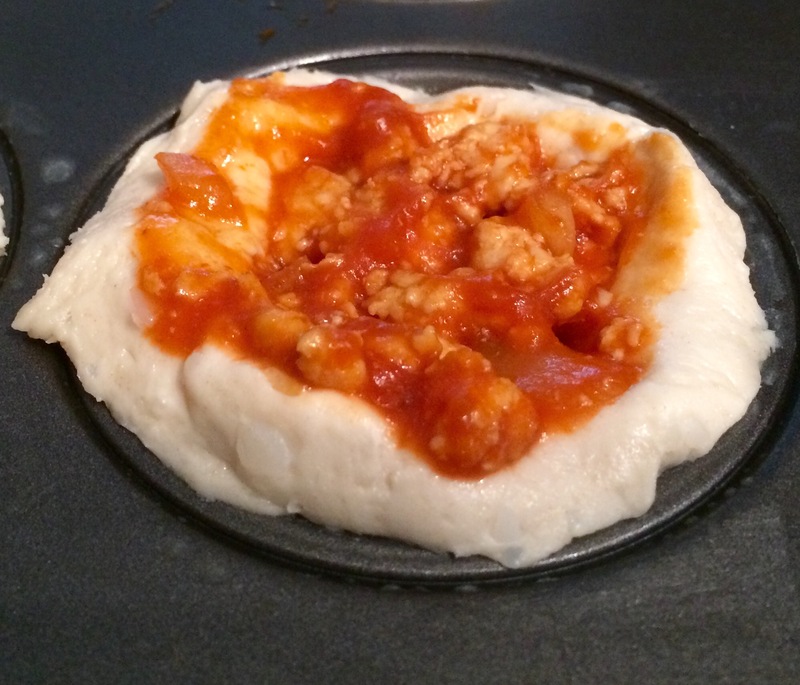 Place in oven for another 10 minutes or until mixture starts to thicken. “It’s not always like the movies.” Well, in this case, the example picture is not always like the result picture. Keep reading and you’ll see why I say this. 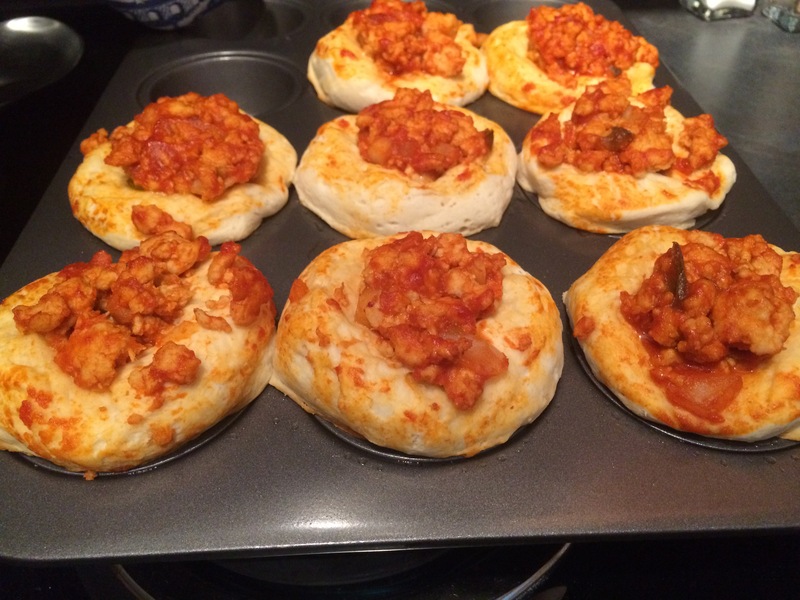 I found this recipe in a time crunch on Pinterest (SURPRISE!). I love how easy it is to find a recipe while sitting in the Publix parking lot (thank you, modern technology). Heat large skillet over medium-high heat. Cook ground turkey for 7 minutes, or until turkey is no longer pink. Drain. 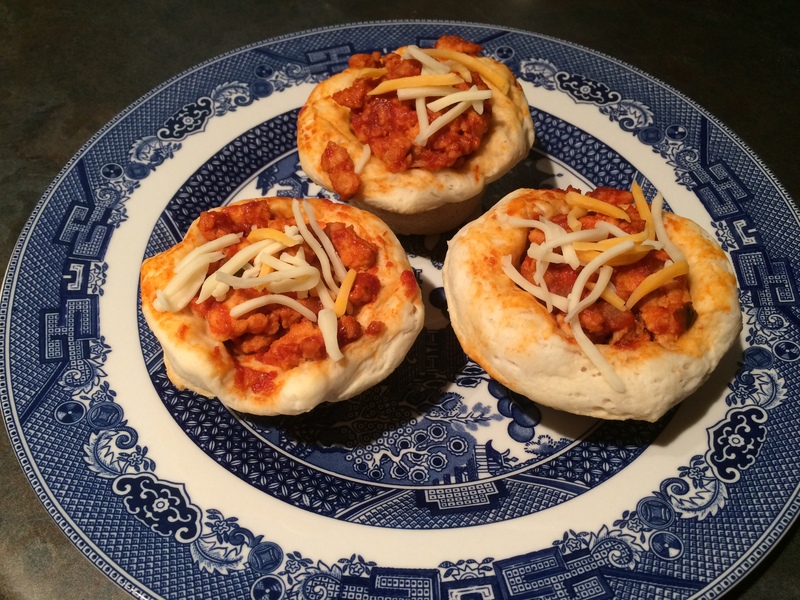 Combine ground turkey, onion, and sloppy joe sauce and heat on medium for 3 (ish) minutes, or until warm. Set aside. 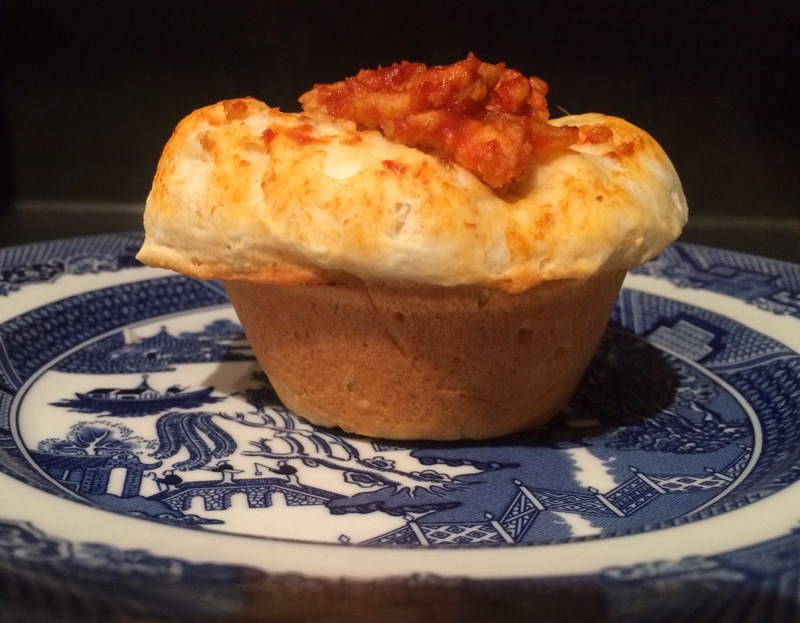 Grease muffin tin with non-stick spray (I used coconut oil). 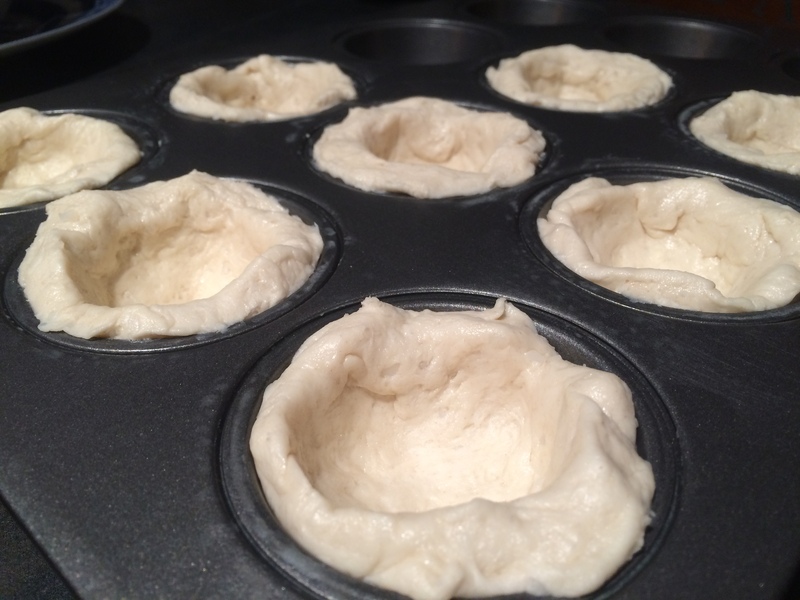 Press 1 biscuit into bottom of medium muffin pan and evenly distribute up the sides. Continue until all biscuits are placed. Add 1/4 sloppy joe mixture to each up (After pouring into cup, I used the bottom of the measuring cup to press the meat mixture into place). Bake for 12 minutes, or until biscuits are golden brown. (I used the time suggested on the biscuits). Remove from oven and sprinkle cheese. Enjoy! I used ground turkey instead of ground beef. 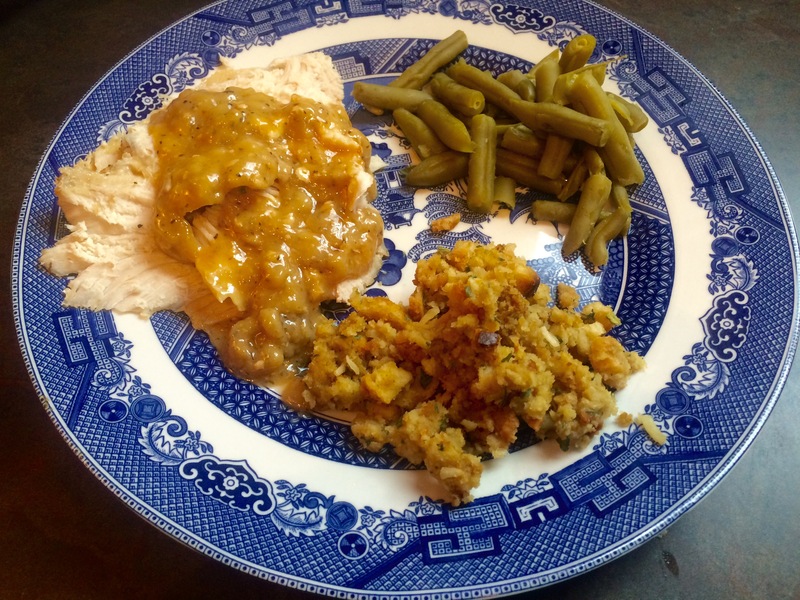 Usually I hear others saying, “Turkey is too dry.” Well, I thought that since I was going to cover it in sauce, it would keep the mixture moist (sorry for those who dislike this word. “Wet” just doesn’t sound right.). I spiced up the Sloppy Joe Sauce by purchasing the BOLD instead of REGULAR. This recipe calls for Texas-Style Buttermilk Biscuits, but my Publix didn’t have these. One quick phone call to Grandma and we determined Pillsbury Southern Style Biscuits would be okay for an equivalent (Grandma knows best!). Next time, I would use smaller biscuits to see if they turn out like the recipe I used as a guide. Although the cups were “poofier” than the example, hubby still ate everything on his plate (and kept it down and NO it wasn’t in the trashcan). Therefore, poofier = delicious. Not feeling 100% today, but I spent the afternoon in the kitchen making some sweet treats with my friend Ashley. I’m trying to convince her to start her own baking/cooking blog because she has some master skills. She made a really neat cookie recipe in a mason jar, but maybe I’ll leave that for her to tell when she starts writing (right, Ashley?). I was flipping through my cookbooks this morning looking for dinner options. I ended up deciding on a casserole that I’ll feature later night, but I wanted something small and sweet to surprise my husband. 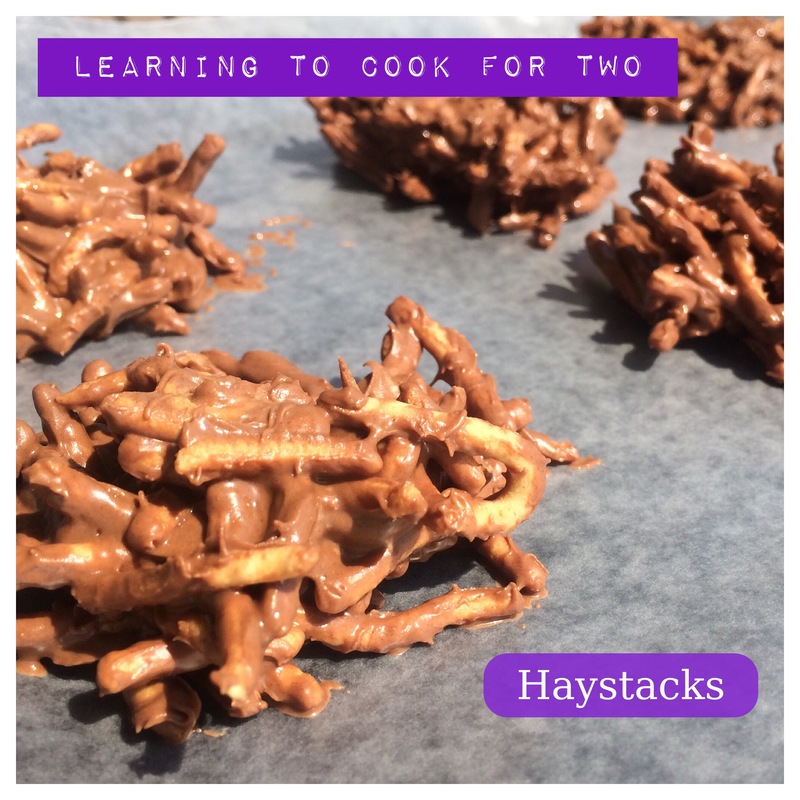 My Grandmother’s Sunday School made a cookbook, so I used a recipe for Haystacks from there. Although I did not follow the instructions as she wrote it (just like a grandchild, eh? ), I used them as guidance. Combine the morsels in a large bowl and microwave for 30 seconds. Stir. Continue this process until your mixture is the consistency you desire. Toss noodles into bowl. Stir. 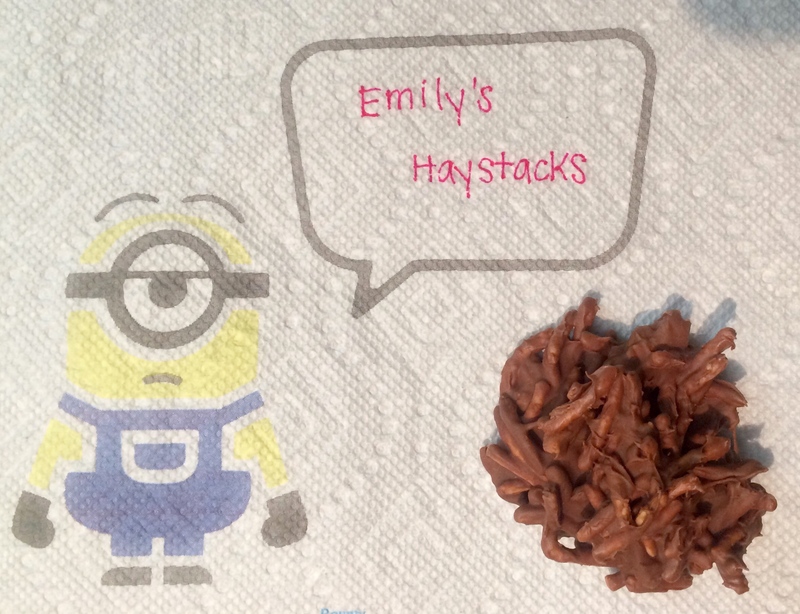 Drop desired size of haystacks on wax paper and refrigerate until firm. A going away party for a fabulous co-worker at work! Since this shower was around the same time as the last, I decided to change my appetizer. 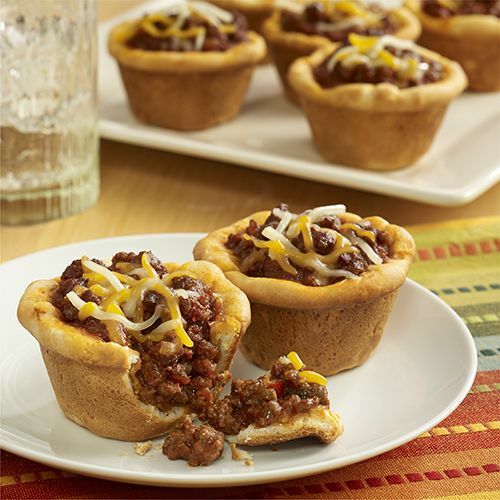 Again, I browsed through Pinterest searching for quick appetizers and found a new item! 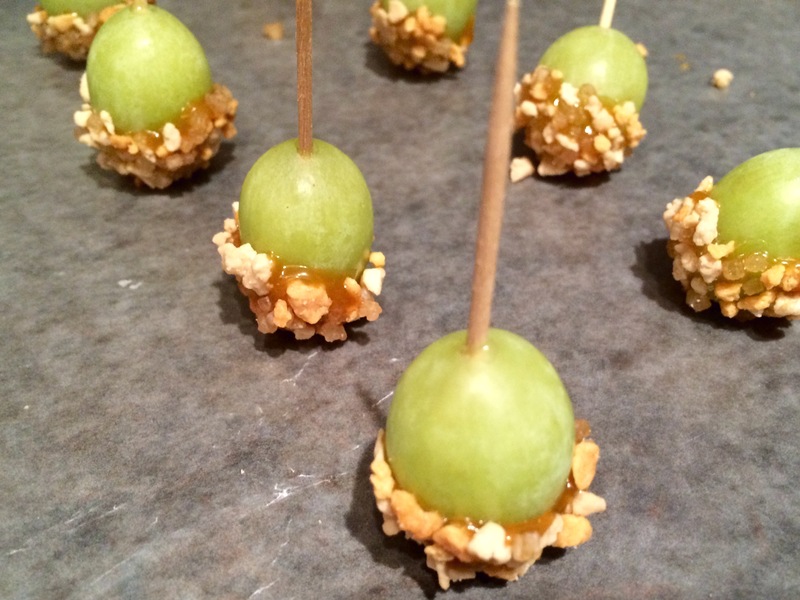 I found a recipe for Caramel Grapes. I prepped by purchasing my ingredients before my stretch of work days. I was able to easily make this after a twelve hour shift at work just before bed. The original recipe calls for nut toppings, but I could not find them at my local grocery store. I went to the ice cream section and looked through toppings. 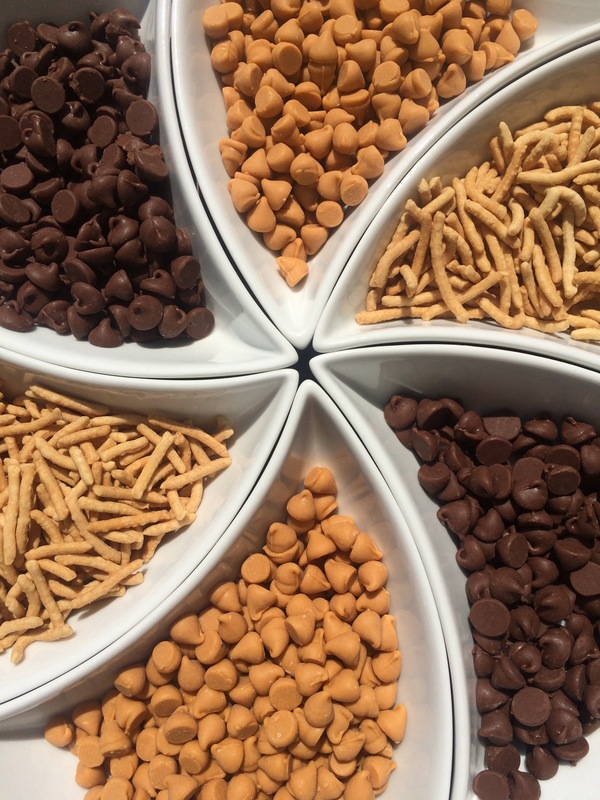 This treat may be a little too sweet for some, so I would suggest nut toppings for the “Less Sweeter The Better” individual. Grapes must be room temperature. Warm caramel dip in microwave for 10 seconds, stir, and warm for another 10 seconds. Skewer grape through toothpick. Dip half of grape into caramel. Dip grape into bowl of praline crunch. Sit on wax paper until you are ready to package them up. You are on the spot. Someone asks you, “What are you going to bring to the party?” You run through the list of things that are easy to grab–plates, vegetable tray, fruit tray, drinks, and utensils, but they are already taken. Crap (or whatever PG-13/R word that happens to slip off your tongue)! *light bulb* PINTEREST! I thought these were a cute idea for a wedding shower at work. 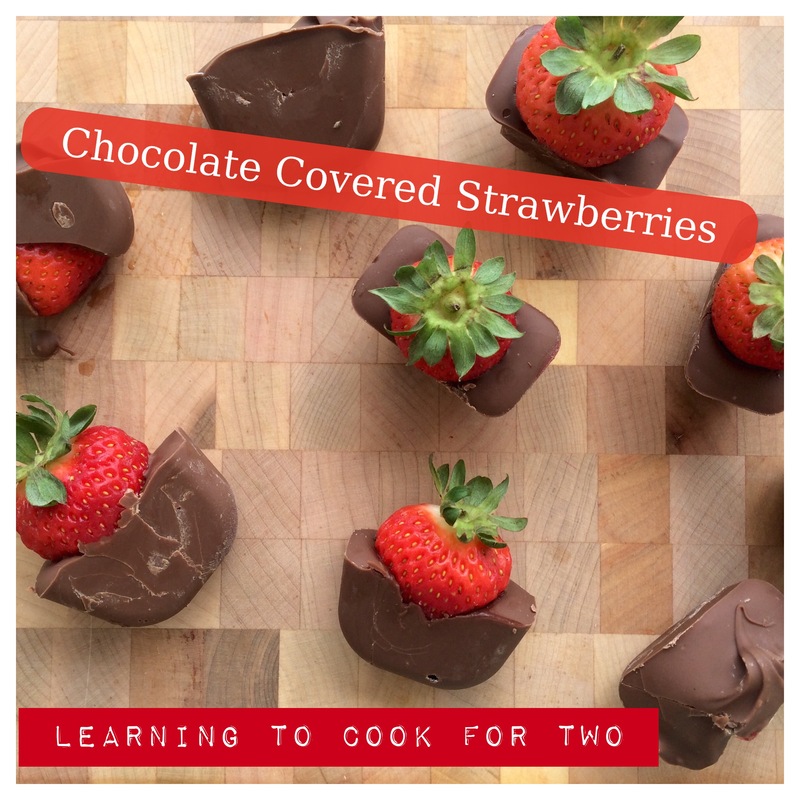 I used the picture on their website as a guide, rather than the recipe. The picture shown above are the strawberries I took to work. Cut the tops off strawberries. 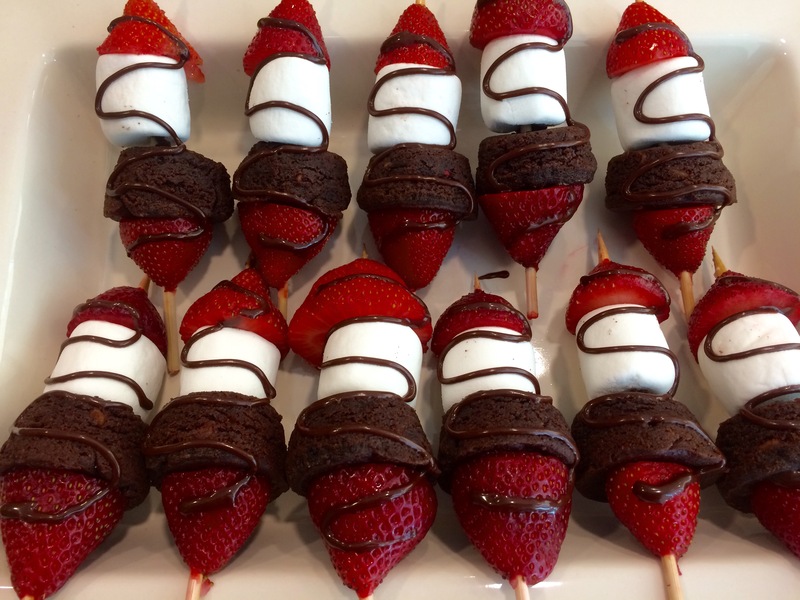 Skewer first strawberry, brownie, marshmallow, and last strawberry. Decorate with chocolate icing. Continue until you have the desired amount of skewers.